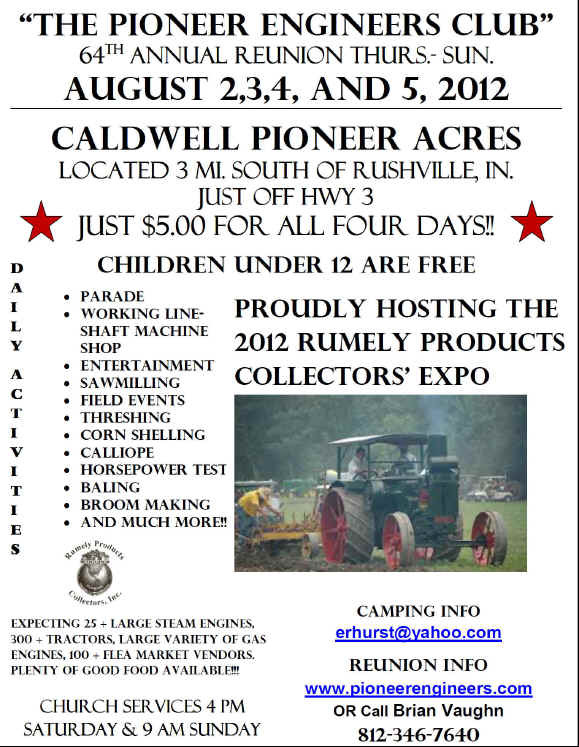 The Pioneer Engineers Club will have it's 64th Annual Reunion August 2nd thru 5th 2012 in Rushville, IN - Click here for more information. Photo's from the July 2012 Oldenburg firemen’s festival posted on Gaar House Photo page. A special 4 of July 2012 event at the Gaar House. Link to the Western Minnesota Steam Threshers Reunion page added to Link to Friends. Pictures of the Gaar House Museum Engine being loaded by the Holps and on its way to Wauseon, Ohio for the Gaar Scott farm machinery reunion this week in June 2011. Update of photo's posted on the Gaar Tractor photo page. The Gaar House flyer from the Richmond Symphony Orchestra's program book. Special thanks to Susan Yaeger "R.S.O." Board. The Wayne County Foundation has authorized a GRANT for Wood Repairs and Painting for the two porches on the house. Volunteer application form posted in "Feedback" section. You may now purchase the Gaar book go to the Products section.